Thursday was bright and sunny, so we went to Borehamwood for shopping, and also had fish and chips in our usual cafe. We asked if they had a box, so that our cat could have our left over fish skins, and they said that if some fish had been cooked that was not served for half an hour they do not give it to a customer, but we could have it for the cat, and not pay anything for it! I expect we will go there more often for lunch. Later I went for a walk and when I got back Florence phoned and chatted for a while. In the evening it was unusually peaceful as the cat was in the garden, eventually we went out to call him and hearing his plaintive reply we found he was shut in our shed. He was overjoyed when he was released. Mas had to go off to the dentist's this morning, so I spent time teaching the cat how to go through the cat door with the flap down as the weather forecast says it will get very cold. With some trickery using his laser light toy I got him used to the cat door being closed. When Mas came back we went to Stanmore for a few essentials, and the weather became really cold. I spoke to Diane, and discovered that she has had the 'flu', but was on the mend. On Tuesday Mas had to go for physiotherapy for his arm again, so I took the opportunity to try and vacuum off the muddy and also sooty paw prints that are tastefully decorating our oatmeal coloured carpet, cushions and white windowsills. Salty has ventured up the chimney a few times, luckily not while the fire is alight! I talked to Pete who saw Carl off on the train; fortunately he is feeling a little better. Pete on the other hand is not feeling very well, and decided not to come up to London tomorrow. Today we went up to St. Albans and met Tania and Robert in the Waterend Barn, and had lunch with them and caught up on their news before finishing our shopping and going home. Tania had knitted one of her hats for Mas, and one for Pete as well. Later I spoke to Toby who has been having health check ups, and will have to have some dental treatment. Mas and I watched Pie in the Sky and The Bill which had an interesting story this time. Monday morning and Mas had to be at hospital by 9.00am for a blood test, then had to wait there for another one after two hours. I managed to get Salty to use the cat door by throwing his toys through it. Mas came back very hungry after his fasting blood tests, so we went out to The Man in the Moon for lunch which was a nice break. Later I took a long walk, and got back as it began to get dark. Playing with Salty in the gloom I touched his nose which gave out a sizable flash of static electricity, but it did not seem to bother him. He is now going in and out of the house every few minutes, and came back one time completely soaked, but dried off quickly. Shame about all the muddy paw prints though. This week was mostly spent cleaning house with Mas trimming back overhanging trees. We went to The Man in the Moon a couple of times, and I have discovered that they serve organic tomato and basil soup with a hot baguette which is really delicious and quite inexpensive. Interspersed with all the chores Mas has been watching Battlestar Gallactica and Wanted Dead or Alive. I have been trying to go for a reasonably long walk each day, and have noticed that the Mahonia is in blossom, and a small almond tree near home is also covered in delicate pink flowers....intimations of spring! It is the wrong colour! Mas said he felt like going for a long walk on a short pier, or in heavy traffic! One evening we watched an old 'Ironside' tape with Raymond Burr. I thought that David Jason in 'A Touch of Frost Frost' was grumpy enough, but Ironside could grump for the Olympics. Spoke to Pete and found out how ill Carl was while staying with him and was sorry to hear it. We let Salty out into the garden, and he spent a long time outside climbing trees, and calling plaintively from time to time. Mas fixed a new washing line for me, and I cleared out the largest planter in the conservatory as Salty had been using it as litter tray as the soil is nice and soft. I spoke to Diane and later we watched The Bill again, and Mas is watching Battlestar Gallactica when he is having rest breaks. Today was very dreary dull weather. My computer began the horribly familiar clicking problem, turning itself off to protect itself frequently. We have already taken it to be fixed for this, but evidently the problem just retreated for a while, only to pounce out again when least expected. I heard from Joan and Chris, and spoke to Pete. Mas began drilling and cutting a hole in the cavity wall of the conservatory to put in a cat door. We could not put it in the kitchen door as it is made of hardened glass. I am going for walks every day to keep fit, and have a break from the cat, and hopefully next week I will have the time to do longer ones. We continued in this way all weekend until the whole house was filled with first grey and then red brick dust, and Mas having many changes of cloths and showers. I swept up, and vacuumed dust up, but the curtains, walls and every surface was dusty including the air. Once the dust finally settles I will have to do an intense early spring cleaning session. Who would have thought that having a kitten would make so much work! Today we woke up to a foggy morning, and after breakfast let Salty out into the garden by himself for a short time. We then drove carefully through the mysterious foggy landscape to St. Albans where we met Tania and Robert. For a change we went to the Waterend Barn; we had not been there for a long time, and Tania was hoping they would have a nice open fire going. 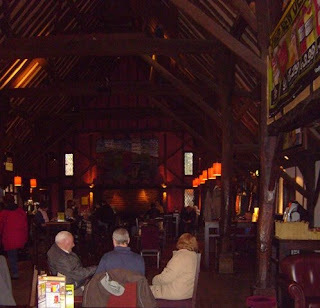 This barn was originally built in 1610, but is now a restaurant and bar. We had a nice meal, but the fire was not lit! 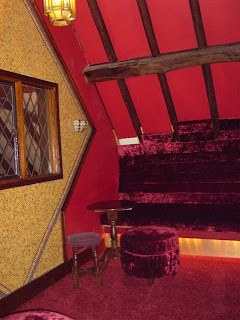 Below is a corner of the ladies lounge where they can repair their makeup and share secrets. Tania and Robert gave me a lovely angora sweater and card as a late birthday present , and Tania had knitted a hat for me too! We got our groceries and drove home safely. We watched a 'Pie in the Sky' episode, and later a gruesome 'The Bill'. The East in Elstree and heroic train driver. Yesterday morning I decided to go into hospital for the blood test that they would need tomorrow, so saving time. This was done, giving me a chance to get in more walking, and I got home around lunchtime. To break the monotony Mas and I went to Elstree, to an oriental restaurant called The East. The restaurant was very pleasant, and we resolved to visit again, when the weather is nice, as there was a lovely view overlooking rolling field, and a terrace to eat out on in the summer. I was evacuated to Elstree during the war as a young child, and when there I always wonder which house I stayed in at the time, but cannot remember. In the evening we watched a Sherlock Holmes with Jeremy Brett; he was such an interesting actor to watch. Today we got up early, and I went off to hospital as planned, but did have to have a further blood test. I will not have to visit hospital again until the end of April, when I will have another scan. I walked up to Hampstead, and caught the tube home. Just outside Edgware the train stopped, and we were told that there had been a signal failure. The train driver kept us informed, and was talking to us the whole time. After half an hour we were told the train would be reversed, and we would go back to Burnt Oak station. We were all moved up to the carriage nearest to the driver, and we set off with him driving extremely slowly and tooting the whistle every three seconds. When we arrived and got out we thanked the driver for his care, and we all got a bus back to Edgware. Mas in the meantime had gone to have physiotherapy on his arm and shoulder. I spoke to Florence, and she told me one of her friends went to change a light bulb before Christmas, and had used a ladder. The light bulb she put in popped, and she fell off the ladder breaking an arm and a leg! She is still in hospital. Ladders always seem so dangerous. Mas found the physio very helpful, and will go back in two weeks, but has exercises to do until then. Today Mas and I went into the garden with Salty. It was cold and bright, Mas was sawing cut off branches and I swept leaves and cleared away all kinds of debris for about an hour. 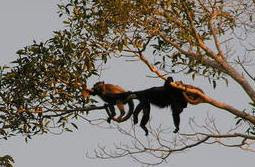 In the meantime Salty climbed five trees several times; he still finds it difficult to climb down the trees, and once I saw him peering down from a tree with his mouth in a comical '0' shape, and he had, at one point, to be rescued from a shed roof. Later I walked down to Edgware, as fast as I could, for exercise, bought Mas a fleece sweater in a sale and a TV guide, and walked home again. Mas, meanwhile, was putting up a new washing line for me. I need not have bothered with the TV guide as there was nothing on that interested us, so we watched an old video with Robert Redford in it called Legal Eagles which was entertaining. We woke up to another cold and frosty morning, and after breakfast let the cat out into the garden. We both went out with Salty, just in case! He went all round the garden sniffing everything, and then went up a little fir tree very quickly, but had trouble climbing down and after letting us know how difficult it was, he fell down from it, but it was not far. Next he shot up a Hawthorne tree, going up to the thinnest twigs, and then began meowing desperately as he could not get down. By now I noticed that it had begun snowing; just little needles of snow. Mas went off and got the ladder, extending it fully. I tried to stop him as he has a history of falling off ladders, but he would not listen, and with me holding the the bottom he went as high as he could, giving instructions to the cat about how to get down, as you do. Eventually Salty got closer to Mas, and with encouragement jumped onto Mason's shoulders. It was at this point that, with the cat still balancing on his shoulders, Mas began to lose his trousers which were descending faster than he was, and I had a chance to admire the goosebumps on his buns as the snow brushed past them. Salty was so happy to be rescued that he was vibrating with joy, and we all went in to get warm again, and Mas and I to have a cup of tea. After this adventure Salty slept most of the day, and I had a chance to do some cooking. Amongst other things I made some rock cakes, only to find out that Salty likes them so much he would steal them if he had the opportunity. On Thursday I received a letter and calendar from my friend Heidi, who lives in Basle, which was a nice surprise. Apart from that, Mas and I had a busy but rather uninteresting day doing housework and fixing up the garden fence still, and I went for another walk. In the evening we watched The Bill which seems increasingly depressing each week. On Friday Mas was supposed to go for a blood test, but there had been a mix up, and as he had not been fasting it had to be rearranged. He did manage to finish the fence repairs though. We went to bed late, and I could not sleep so listened to music on the radio, Through the Night with Jonathan Swain, and luckily he played Janacek's String Quartet, number one, which I really like. On Tuesday Glen called in and had a sherry and biscuits, and told us what a nice time she had during the holidays with her daughter and family who had been visiting her. Afterwards I went for a walk, the longest I had done for a while which pleased me. Mas was making repairs to our fence in preparation for Salty being let out into the garden. I was having a rest later, when Manu phoned, he is looking forward to getting together one evening soon. Today we had lunch in Stanmore, after doing a few chores and shopping, and sinfully watched an afternoon film on TV. Pat phoned, and later so did Toby. He and Romy really enjoyed their holiday in Guatemala, going into the jungle and looking at Mayan ruins. It must be interesting to hear Howler monkeys in the morning rather than birds. Yesterday we both sorted things out, tidied up, and generally updated things for this year, and relaxed. I was making the bed, and throwing a light cover over Salty as he likes rolling around and fighting under the blanket. During these games I panted at the cat like a dog, and all his fur stood on end. I calmed him down, but his tail stayed puffed up for about twenty minutes. After a late breakfast, Diane called and asked if I could collect her from the hospital today; the hospital would not carry out the procedure if she was alone. I had also been trying to phone the hospital on my own account, so I went to my department and sorted that out before meeting Diane. We went to the 'Ask' restaurant in Belsize Park, and had some soup and caught up on each others news, which was nice, before making our separate ways home on the tube. The weather is still very cold. Later I took down the few decorations that I had put up. Yesterday, Mas and I received our Christmas present from Pete, and a card from Diane. I spoke to both of them too. Generally we relaxed, but we did go out to buy a better kitten collar from Boreham Wood, as the previous one we had bought was not very good, and had 'Salty', and his phone number engraved on it. We began watching one of the episodes of 'Dead or Alive' that Steve McQueen made, which Mas enjoyed out of nostalgia, followed by a Battlestar Gallactica. Today, Mas without a struggle, the cat got his collar put on which he made no fuss about. I also gave him a worm pill which he ate as if it was a special treat. Mas spent time clearing the garden, and I had a long talk with Florence, and caught up with some e-mails. Strangely Salty began sitting like a white Meerkat today, on his hind legs with his paws dangling in front of him. The weather is cold, and we have mostly been hibernating indoors watching the fire and television in the evenings. Today, we set off for Monika and Oktay's house, just before lunchtime. I was feeling apprehensive as we always get lost, but Mas was feeling very confident as we had a google map print out. After driving for what seemed hours, and asking for directions at two different pubs, by accident we came upon the right road, and arrived at our destination, shaken but not stirred. 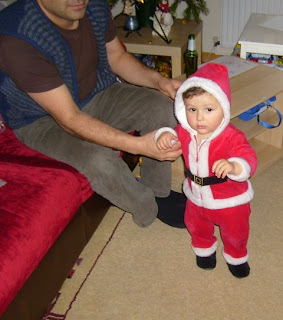 Everything was bright and cheerful, and little Radovan was dressed in a Father Christmas suit. Milan was explaining things in his biology book! Monika made a really nice meal and for the main course had roasted, cooked, barley together with mushrooms, chicken and onions and served with yogurt and pickled gherkins. (I got the recipe from her later). We had a lovely day with them all. 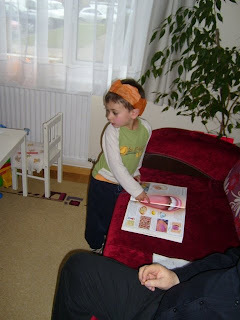 Little Milan, at one time, was playing cards with Oktay, and talking his own made up language, and saying "pampoosh" expressively from time to time. This seems a very useful word to me, and I think I will adopt it too! Oktay goodbye, and immediately shot off, taking the wrong exit, which Oktay saw. Driving in unpredictable directions for a long time, we eventually surfaced in Radlett, and thankfully drove a familiar way home. When we pulled up, Mas said what hairy journeys we had made today! We received a warm welcome from Salty, and after some time Oktay phoned to see if we had made it home, or had gone to Bristol instead!